Bienvenidos en la Republica-Dominicana ! Welcome to Dominican Republic! Since putting forward this destination by the tour operator Marsan at the end of year 90, nearly 50 000 French who come each year to the Dominican Republic. The Dominican Republic is known primarily for its white sand beaches and coconut ofPunta Cana. It still offers a variety of strengths. The Northern beaches are a little less busy side Cabarete Samana is beginning to develop its tourism potential. To the south, the beaches of Boca Chica are the first to be opened to tourism, hotels are also numerous. Apart from its beaches, the Dominican Republic has some lesser-known assets. 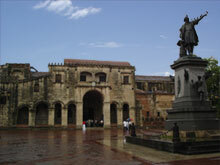 A visit to Santo Domingo, the largest city of the new world founded by Christopher Columbus, worth a detour. Part of the city is listed as a World Heritage of Humanity. backcountry can make horse riding or bathing in the waterfalls of fresh water. Farther west, the Crocodile Park you will enjoy the diversity of landscape. without forgetting the Cordillera Central with Pico Duarte, the highest point of the West Indies to over 3000 meters, which offer striking contrasts. But the Dominican Republic is worth seeing for its people to the joy of living. In the land of Bachata and Meringue, DOMINICAN people saw almost as for his music, accompanied mostly by the famous Vitamin R . Here we do not s'ennuit and every occasion is good for dancing. The Dominicans are always smiling. But like any country where tourism is developing very easily, there are still some pitfalls to avoid. The Dominican Republic is one of the most attractive destinations in terms of price, and price offers are unlabelled PLETOR internet. Tour and decryption with Trip2visit.com. Add to bookmark this page Dominican-Republic " Home Dominican-Rep " - Firefox do "Ctrl D"